AeroLog Pro is a fourth-generation logbook program which will easily meet the needs of most any private, commercial or military pilot. What's more, AeroLog Pro was designed from the ground up to meet the pilot tracking needs of a commercial flight operation as well. Flight departments, Part-135 (scheduled or unscheduled) operators, or even Part 121 operators can benefit from AeroLog Pro's comprehensive tracking of flight time, duty time, checkrides and recurrent training. Built in AeroCalc™ Script language. Comprehensive checkride & recurrent training tracking. One of the perennial problems with logbooks in general and electronic logbooks in particular is the tradeoff between detail and simplicity. In order to produce the reports required for insurance and job applications, you need a detailed breakdown of flight time and experience. However, detail requires a lot of entry fields and consequently a lot of screen "real estate." Placing all the fields in a scrolling "mile-wide" table, while traditional-looking, is not the answer. AeroLog Pro solves this problem by providing two "views" of your logbook. 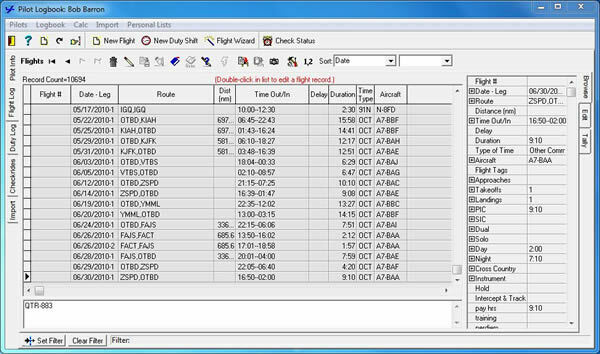 This Browse view (above) shows a traditional "tabular" view of flight log records on the left, and a detailed view of the selected or "current" flight record on the right. 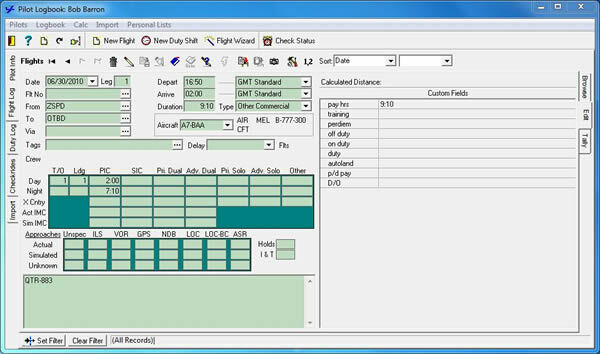 Flight details are displayed in a unique control called the "Flight Inspector". The Flight Inspector allows you to expand or collapse the display to show various degrees of detail. The Flight Inspector allows you to expand or collapse the display to show various degrees of detail. The figure to the left shows the PIC field in its expanded state, which includes Day (PIC_Day), Night, Cross Country, Actual and Simulated. The Edit view (below) is used to enter a new flight record or to edit an existing one. Unlike in the Browse view, only the "detail fields" (the fields where actual flight data is entered) are presented. General flight information fields are located at the top-left. Below are two "breakdown" tables: one for flight times, takeoffs and landings; and a second for instrument approaches. A memo field for remarks and notes is located at the bottom. Custom fields, if any are located in a Flight Inspector control on the right. 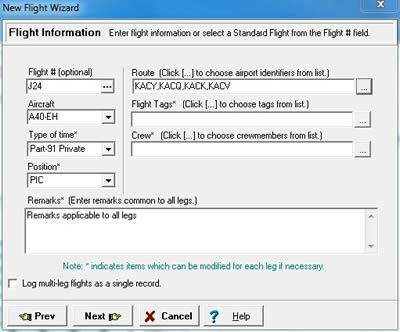 The Flight Wizard virtually eliminates the tedious and time-consuming duplicate entries required when entering multiple leg flights. The wizard collects information about the flight by presenting a sequence of pages. At the end of the process, a flight record is added to the logbook for each leg of the flight. You can optionally log the multi-leg flight in a single flight record. The aircraft and the route of flight is specified on the Flight Information page, along with several other flight parameters which may be common to more than one leg of the flight. The individual leg records are preset with this information as they are generated by the wizard. The Leg Details page lets you easily and quickly enter the leg-specific flight information. Presets from the Flight Information page minimize duplicate entry. When you are finished entering the details, simply click the Ok button and a flight record is posted to your logbook for each leg of the flight. 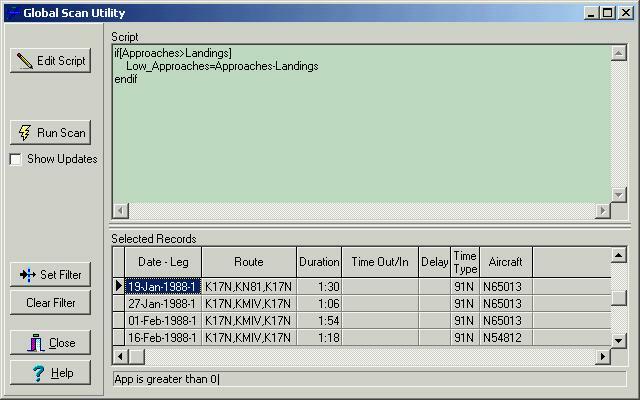 AeroLog Pro includes its own built-in scripting language. Using AeroCalc, you can program the Flight Log entry screen (by writing your own AutoCalc scripts) to perform custom pre-sets, calculations and error checking. What's more, you can program "batch" modification of your existing flight records using AeroLog Pro's Global Scan Utility. Using Global Scan and a custom script that you write in the AeroCalc language, you can quickly and easily modify large numbers of flight records without manually editing each one. 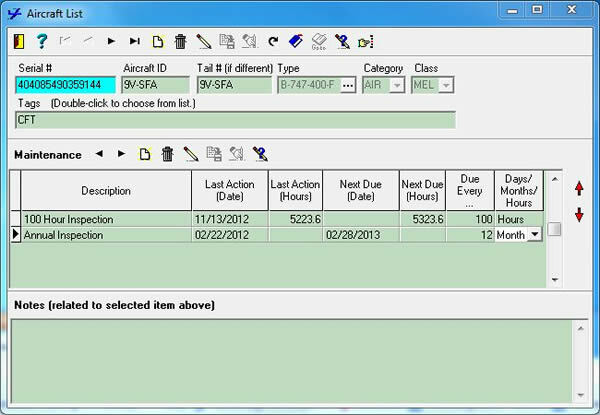 AeroLog Pro includes a separate and independent duty shift log for recording pilot duty times. Since duty time is logged separately from flight time, non-flight duty time is easy to record. AeroLog Pro's open-ended design allows you to enter and track any number and type of checkride. To track an item, simply add a new record, enter the description, the date of the last check and specify how long the check is valid. The program automatically calculates and highlights the due date. Equipment checks are tracked in a separate table custom tailored for 135.293 checkrides. Aircraft owners can use AeroLog Pro to track any number of maintenance and inspection items for their aircraft. Items can be scheduled by date or engine (hobbs) hours. Each item has an associated Notes memo field where you can record detailed remarks and reminders. AeroLog Pro supports the importing of flight records from external files and databases using Microsoft's Open Database Connectivity™ (ODBC) services. ODBC allows access to varying data formats through the use of special ODBC Drivers. Many "standard" drivers are provided with the Windows operating system, including drivers for CSV (Comma-Separated Value) text files, Microsoft Access, dBase, Paradox, FoxPro, Excel, and others. In addition, many proprietary databases formats are accessible via ODBC drivers provided by their manufacturers. Data & Report Export -- Reports and/or report data can be exported to following formats: Lotus 123, Quattro Pro, Excel, Bitmap, JPEG, WMF, TIF, HTML, XHTML, PDF (Adobe Acrobat) and RTF. Flight and Duty Time Report -- This unique report combines flight time log and duty time log information into a graphic representation of monthly pilot activity. The report is ideal for documenting pilot flight and duty time for the FAA. In fact, the report mimics the hand drawn graphs many FAA POI's are familiar with. Pre-Defined Standard Flight -- Standard "routes" or scheduled flights can be entered into the Standard Flights list. 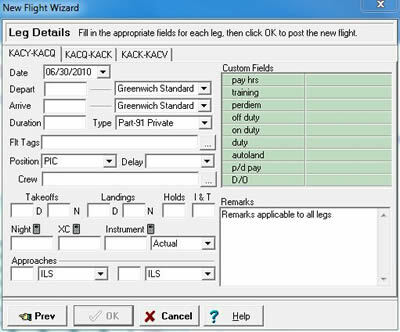 The standard flight information can then be used to automatically fill in many of the logbook fields during flight entry. Custom Report Designer -- Design your own reports or modify the library of pre-defined custom reports using AeroLog Pro's built-in Query and Report designer. 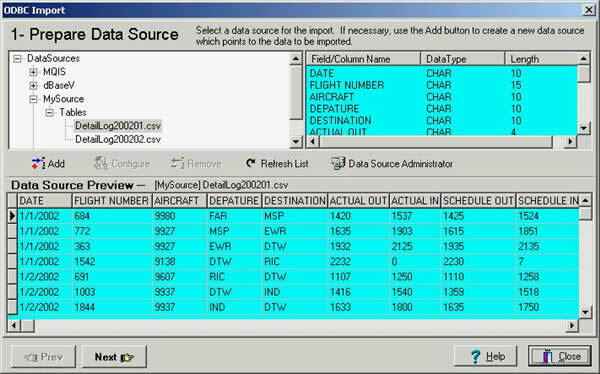 Multi-Pilot Reporting -- AeroLog Pro organizes data in a way that allows both single-pilot and multi-pilot reporting. This means that, for example, you can print a single report which lists the checkrides that are about to expire for every pilot in the system. Minimum 20 MB hard drive space (empty data files). Display size: 800 x 600 (minimum).